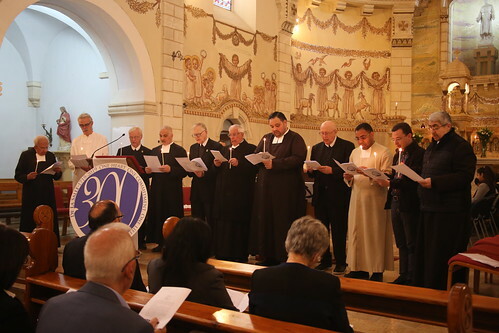 On 7 April 2019, Bethlehem University faculty, staff, and the De La Salle Christian Brothers commemorated the 300th anniversary of the death of Saint John Baptist De La Salle, the Founder of the Brothers of the Christian Schools and the Patron Saint of all teachers. A Mass presided by Father Peter DuBrul was held at the Chapel of the Divine Child. During the Mass, the De La Salle Christian Brothers publicly renewed their oath to fulfill the mission of St. John Baptist De La Salle, as demonstrated through their service at Bethlehem University. Celebrations of the day included the annual recognition and thanks to members of the university community for their years of service and commitment. The University recognized 74 employees including five retirees and provided them with a memento of their time at Bethlehem University. Thanks to the work of many on campus, Bethlehem University honors the heritage and contributes in promoting the legacy of Saint John Baptist de La Salle through its mission to provide quality higher education to the people of Palestine.